Well the festival of chocolate is nearly upon us. I do know, of course that Easter is a very special occasion in the Christian calendar and for many others is about the celebration of Spring, but for us chocoholics, it’s a very good excuse to indulge. For those of you who read my review of this incredible chocolate back in February, you will know that I am now a fan. Not only does the chocolate taste fantastic, but this bean to bar company is enriching the local economy right where the chocolate is made in Madagascar. Earlier on this month, co-founder Brett Beach was over in London giving talks about the company, its work in Madagascar and the Fair for Life brand. He was also conducting chocolate tastings. Sadly, I was unable to make it, but to help me get over my disappointment, I was sent a couple of bars of chocolate. Sampling Madécasse chocolate makes you stop and think a bit, not only about where chocolate comes from and how it is grown, but about the different flavours that circulate in the mouth. A pack of these bars would make a very special Easter gift for the chocolate connoisseur in your life. Fruity chocolate with a clear high note followed by a warm nutty taste. courtesy of the mildly salted almonds on top. This has an earthier quality and despite having a higher cocoa content than the salted almond, it tastes sweeter. Earthy coffee notes with mildly salted crunchy cocoa nibs on top. Waves of flavour cross the palate which makes it quite intriguing – from salty to earthy, then sweet to bitter. I wrote recently about the importance of buying fairly traded chocolate, so I am not going to repeat it all again here. Suffice it to say that there is a huge range of Easter Eggs on offer to suit all ages and tastes and they are not difficult to find here in the UK – just look for the Fairtrade mark. I was sent a few to sample from the Fairtrade Foundation. I’ve been a fan of Green & Black’s since they produced there very first bar way back in the 1990s. Not only are their bars Fairtrade, but they are organic too. They are also very tasty. In fact their spicy orange bar Maya Gold, was the first chocolate bar to gain the Fairtrade mark in 1994. This 165g egg is plain chocolate made from high quality Trinitario cocoa beans. It’s robust and earthy in flavour with notes of tobacco and coffee – one of my mother’s favourites. Cocoa Loco is not a brand I am particularly familiar with, but if these cute little pigs are anything to go by, it’s one worth taking note of. Pigs heads certainly make an interesting change from Easter bunnies. These are organic as well as Fairtrade and the the sweet white chocolate is lifted by the sharp zingy notes of raspberry. I’m not normally a fan of white chocolate, but these disappeared with remarkable rapidity. This milk chocolate egg is made for youngsters and to tie in with the movie. It comes with sheep’s ears and a wooly top. I decided it would be far more appreciated by my next door neighbour’s grandchild than by me, so I passed this one on. I’ve written plenty about Divine over the years; it is co-owned by the farmers that grow the cocoa beans in Ghana and was the first UK company to be 100% Fairtrade. The Easter eggs sold by The Meaningful Chocolate Company, are not only Fairtrade, but they tell the story of Easter. It is true that many no longer know the Christian meaning of Easter and why it is celebrated. With this in mind, David Marshall, now CEO, decided that an Easter egg was needed that was both ethical and put people back in touch with the Easter story of Jesus. In true Christian style, the company also donates a proportion of its sales to development and educational charities. This year 10p from every 150g egg will be donated to Traidcraft. In addition to the two eggs I was sent, there is also a 180g dark chocolate egg on offer. Eggs are stocked at varies independent retailers as well as Tesco, Morrisons and Waitrose. 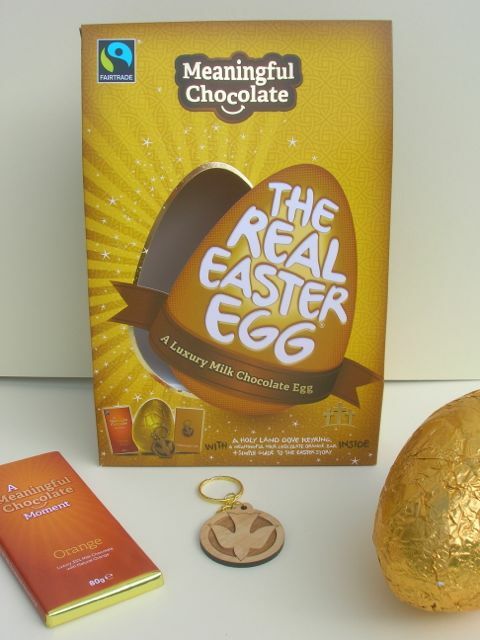 These eggs come in two sizes, a 150g box which includes a 25g bag of milk chocolate chunky buttons and a large 280g one which includes an 80g bar of orange milk chocolate and an olive wood dove keyring from Bethlehem. Both contain booklets relating the Easter story, though one is illustrated for children and includes an Easter quiz, a recipe for Easter biscuits and a jolly 3 ft Easter banner. The chocolate has a relatively high cocoa content and is creamy with caramel and vanilla notes. It’s a little sweeter than I would normally prefer, but it has a good flavour and I really liked it. The orange chocolate bar had the scent and taste of real orange, which as it contained orange oil should not really have been a surprise. CT is very fussy when it comes to orange flavoured chocolate and is rarely keen. However, the balance here is good and he gave it the thumbs up. For something whimsical, curious and completely different, there is fun to be had with Monty Bojangles. The Easter egg boxes weigh in at 200g and contain a 120g Belgian milk chocolate egg and 80g of truffles. The chocolate wasn’t overly sweet and it had a pleasant nutty flavour. Despite the purist in me sniffing at the palm oil included in the truffles, I really enjoyed them. They are all smooth, rich and unctuous and dusted in bitter cocoa powder which makes a fantastic contrast to the sweet insides. All contain intriguing crunchy bits. The packaging is colourful and interesting with lots of pictures to look at and snippets of the fantastical adventures of Monty Bojangles. At £6 an egg, these seem eminently reasonable. We should perhaps have been alerted by the name, but CT and I were in for a surprise when we bit into these truffles; they made us both giggle as the crescendo of crunchy popping candy drowned out all other noises. With a rich and fruity flavour as well as the element of fun, we both quickly reached for seconds. Not such a surprise, but equally tasty, these truffles held pieces of crunchy toasted hazelnuts. Much as I loved the Berry Bubbly, these were my favourite. The slightly salty dark intense truffles contrasted very nicely with the sweet flecks of butterscotch. Chocolate to cook with is always welcome around Easter time. I have used Dr Oetker’s 72% Fine Cooks’ dark chocolate on a number of occasion and I’ve always found it easy to work with and it’s consistently produced good results. It should be noted however, that this is not suitable for vegans or those with lactose intolerance as, unusually for dark chocolate, it contains whey and milk. I was sent a couple of bars of chocolate with some cocoa powder, baking powder, vanilla extract and a packet of rich chocolate cupcake centres with the intention of making these surprise inside chocolate cupcakes. I haven’t made them yet, but they may well appear on the Easter tea time table. Thanks to Madécasse, the Fairtrade Foundation, The Meaningul Chocolate Company, Monty Bojangles and Dr Oetker for the chocolate. I was not required to write positive reviews and as always, all opinions are my own. yum you are making me want choc now! Wow some lovely looking chocolate! I love Dr Oetker and I think the meaningful eggs are a great idea as they remind people of the meaning of the holiday. Yes, very good point Ellie, I think the meaning of holiday passes most of us by these days. Some great new brands I will look out for. Fair Trade as a brand has its issues though, better to look for rainforest alliance or plain old ethically sourced. Thanks Caity. Fairly traded is what I look for, which covers lots of different ethically sourced chocolate. Bean to bar producers are some of the best. Favourite groumet eggs? I’ve not been lucky enough to try one, but I’d love to have one of Paul A Young’s. Cornish bean to bar Chocolarder is rather good, though again I haven’t tried an egg. I’ve not seen the majority of these but i’ll definatly look for them now ( especially the berry bubbly one). I’ve had my nephew making his mum nutella-filled chocolate eggs, they were more flat shaped but she appreciated the home made gesture. Thanks Amy. Ah, who wouldn’t appreciate your child making you Easter eggs, what a lovely thing to do. The bubbly one, is very bubbly and is great fun – tastes quite good too. That Madecasse chocolate looks fab, I love things you can trace back to the source and passionate companies always win me over. Looks like you had a chocolate filled week! Haha Liana, I always try to have a chocolate filled week, although perhaps not quite like that one! Madécasse is great on all front, ethical, passionate and so importantly, delicious. Oh no! What are you doing to me, such good article filled with chocolate sweetness, I wouldn’t mind some of them now! I’m a big fan of dark chocolate and I cant wait to stock up on some this Easter! Well, it is meant to be a little bit tempting Lily 😉 Hope you manage to get some good chocolate. a chocolate lovers paradise. loved these reviews! I am so excited for all the chocolate this weekend. You’re going to indulge then Dannii? I love Madécasse. It is slightly under conched, but not unpleasantly so and the flavour is amazing. They have a whole window in Wholefoods Market Kensington at the moment. Yes, you’re right Helen, it’s not as smooth as some, but it has a fabulous flavour. I’d love to try more flavours 0 a quick hop and skip to Kensington then! My gosh Choclette, you’ve been munching your way through quite a lot of choccie in the name of bloggie research!!! And very interesting to see the differences in ingred’s. What a hard job you have!!!! If you ever need any help testing and tasting, just send some my way (says little miss piggie who has just munched her way through her favourite Hotel Choc box)….. Talking of piggies, I love the look of those raspberry chocs…. I am very partial to freeze-dried raspberry! Haha, indeed Karen. Only trouble is, what am I going to do for Easter?